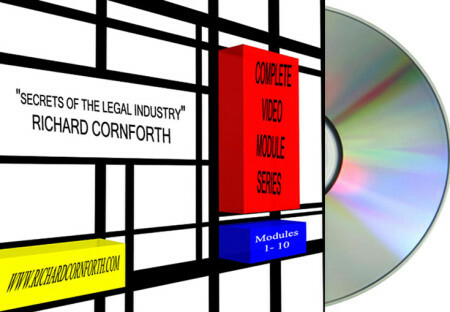 Acquire any single item of RICHARD CORNFORTH books or videos by “ITEMIZED SHOPPING” Richard Cornforth is a much sought after legal researcher, instructor and seminarian. He is the lead instructors of both seminars and classroom study. Cornforth is well-known author and a leader who helps thousands of individuals across the nation to learn, understand and to use resources available to assist them in winning their battles throughout the Legal System. CONTACT RICHARD CORNFORTH TO CONFIRM YOUR ORDER OR REQUEST A CUSTOMIZED VALUE PACKAGE TO FIT YOUR SPECIFIC ISSUES. CORNFORTH’S approach is purely instructional and educational. Students who has had the opportunity to learn from him have become successful navigators winning their own lawsuits. Learn more in three hours about how to defend your rights, than you can in three years of law school. Understand the fundamentals of litigation and a priceless resource whether you are the plaintiff or defendant, (2 disk). Learn what the Constitution really means along with annotated sighting and what your Constitutionally Reserved Rights are, (2 disk). About 95% of all criminal matters are plead out. Learn why most of those case never should have been filed. Learn the advantages of representing yourself. Learn why most courtroom battles are won or last before they are even fought. Learn how to win your battles before they are even fought. Learn strategies that have actually worked to protect you from abusive IRS Agents and Tax Division attorneys, (2 disk). Learn why the governmental tort claims are the ultimate means to vindicate your rights. NOTE: A book and supporting pleading library are still in development with the intent to result in providing remedy for those who fought the good fight but were shafted by the evil empire known as the Legal Industry. CD-ROM pleading library and notes will companion this DVD for copy, cut and paste purposes. Don’t be hounded by third parties and fraud by illegal shams, schemes and rackets, (Bread and Butter for the Bar and Consolidating, Reduction Agencies). Learn how to use the F.D.C.P.A. to protect you and cleanup your credit report. NETWORK and read testimonials with so many others that have benefited from this material. Learn “Collateral Attacks” to recover damages from shyster. Understand the fundamentals of litigation and a priceless resource whether you are the plaintiff or defendant. Step by step strategies for counterattacking lawyers who by credit card charged-off accounts then pose as third-party debt collectors. This book is a priceless resource for those who want to protect themselves from debt collection scams including how to get them to pay you money! Comes with a pleadings in MS Word format including winning strategies. DO NOT ALLOW YOURSELF TO BE SUBJECTED TO A JUDGMENT THAT IS VOID! Who says or… how to win all your legal battles before they are even fought! What is…is! ONLY THE FACTS! No Authenticated Evidence, No Competent Fact Witness, No Case…(A “NON-SUIT” as a matter of law)! Strategies for “Collateral Attacks” for damage recoveries, (educate the judiciary)! Why is learning about “securitization” so important? No matter if you have already lost your home or are in the “fire” now, this book will give you the “heads up” on how to gear up, attack, fight and deploy with “full artillery”. Learn why governmental tort claims are the ultimate means to vindicate your rights. Results in providing remedy for those who fought the good fight but were shafted by the evil empire known as the Legal Industry. A definitive work on a variety of legal strategies again affirming that YOU CAN WIN YOUR CASES AGAINST BAR-LICENSED ATTORNEYS. A virtual mini-law school education on procedures and the all important subject of evidence. The templates in this book come in MS Word format for easy formatting. A “wealth of information” on the economic side of law and government including special resources for writing IRS fraud and proof positive that you can bring a lawyer to his knees, force him to lose and even make him cry. The templates in this book come in MS Word format for easy brief formatting. A commentary on the Constitution. The manual illustrates the deception and fraud perpetrated by our government throughout the legal industry and how our Politicians manipulate the entire judicial process. 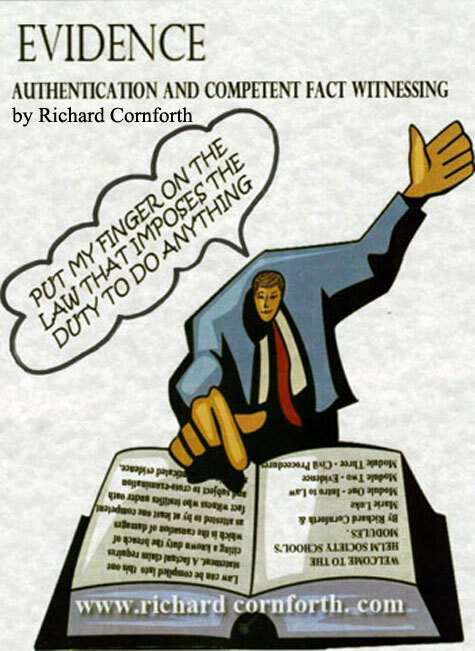 When Richard Cornforth published this, his first book, it set of a firestorm of protest against the legal industry. 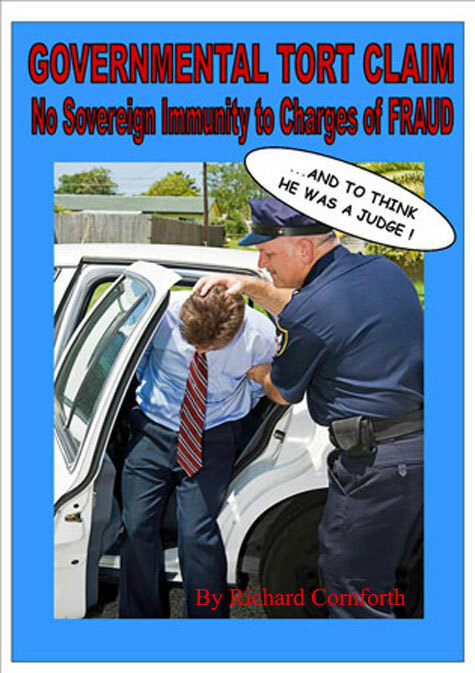 After generations of being oppressed in sham court proceedings, this book empowered all readers with the knowledge that almost everything done in a courtroom for at least the past 33 years was a sham due to due process violations, frauds perpetrated by lawyers and judges, an inherent lack of authority by the judge, or even if the judge and lawyer were both members of the bar. This information is so empowering that students learn that even if there was no witness in the proceedings they were VOID and further gain incredible empowerment by learning that there is no statute of limitations on attacking a void judgment. Comes with templates and resources in MS Word format or simple and easy brief composition. Pound for pound and dollar for dollar, the most valuable resource that you can every use. The teachings in this book have been adapted and are in use in two prestigious law schools. Incredibly valuable information verifying that the civil court proceedings abused by the legal industry without known exception have resulted in VOID JUDGMENTS which are subject to being vacated without time limitation. A surprisingly short book given the incredible number of criminal cases which were useful in scamming the American people. Like the civil procedure book, the emphasis is on helping the student discover why almost all criminal proceedings forced on the American people are VOID. Comes with a mini-pleadings library in MS Word format. 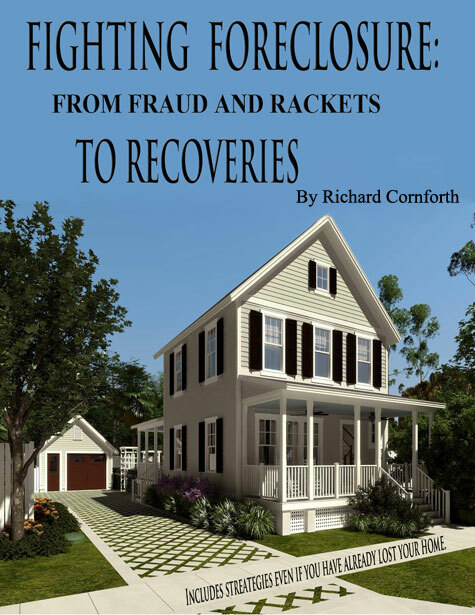 A valuable supplement to Richard Cornforth’s first four books revealing the evils of the legal industry including invaluable information about the IRS! The closest thing to a silver bullet that you’ll ever have the opportunity to use against the IRS based on their own laws! Not only a fail-safe way to absolutely avoid being prosecuted for a tax crime, and almost fail-safe way to avoid losing any money or property to the IRS even if you lose your case against the commissioner! Comes with a very extensive pleadings library that empowers you to bring the IRS to their knees by obeying the laws of the land! Separates fact from fiction including foundation information that led to the mortgage meltdown of September 2008. Being in a courtroom during a proceeding or trial is the last place that you ever want to be! Learn how to prepare for a trial, civil or criminal, and learn why most trials are over before they start. Believe it or not, YOU have a duty, as a litigant, civil or criminal, to inform the judge of the rules that you want to play by! Comes with a mini-pleadings library including scripts for how to argue during court proceedings. This book is a valuable addition to Thou Teacheth My Hand To War and the student is well advised to use this book in conjunction with the book on Objections. NOTE: This book has been updated and is offered by Richard Cornforth. When the student completes this workbook and by researching collateral materials, the student, in short order, learns more about law than about 99% of all lawyers and about 95% of all judges. Get this book, complete the exercises, then blow them away! A pleading is a formal written statement filed with a court by parties in a civil action, other than a motion. By stating what claims and defenses are at issue, pleadings establish the issues to be decided by the court. Richard Cornforth’s Pleadings Library contains approximately 175 different subjects/issues, each subject containing many additional pleadings and letter files compiled in MS Word format enabling you to cut and paste your own pleadings. There are hundreds and hundreds of editable documents for your own individual customization. Normal price $1,250 for Corndforth’s entire legal library, with a 15% discount making the price $1,062.50.